﻿It's very simple and straightforward to make too. Just make your favorite sugar cookie dough (chocolate dough would have been fun for the candies). 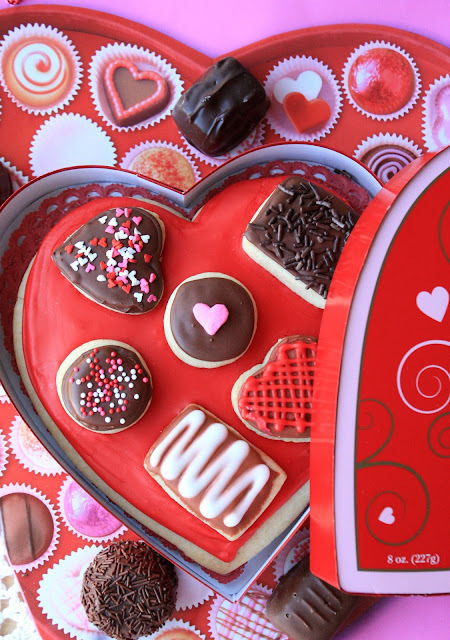 Use a large heart cutter to represent your box of valentine candy, and other small cutters for the candy cookies. I actually only had small round cutters, and cut out the little hearts and rectangular shapes by hand. Bake cookies as directed and let cool. Now the fun part...decorating! Whip up a batch of royal icing, divide it up and add the food colorings of your choice. I stuck with the classic valentine colors of red, white and pink. I also made two shades of brown: "milk chocolate" and "dark chocolate":) I wish I had seen Sugarbelle's recipe for chocolate royal icing yesterday! It would be PERFECT for this cookie project! First, ice the individual small candy cookies. Top some with sprinkles while the icing is still wet, or with more icing details (after the first layer of frosting dries). While the small cookies are drying, ice the giant heart cookie. I placed the "candies" on the giant heart cookie while the icing was still wet, so that it's all one unit. My cookie is a simple design, but of course you can get as detailed, fancy, and creative as you'd like. 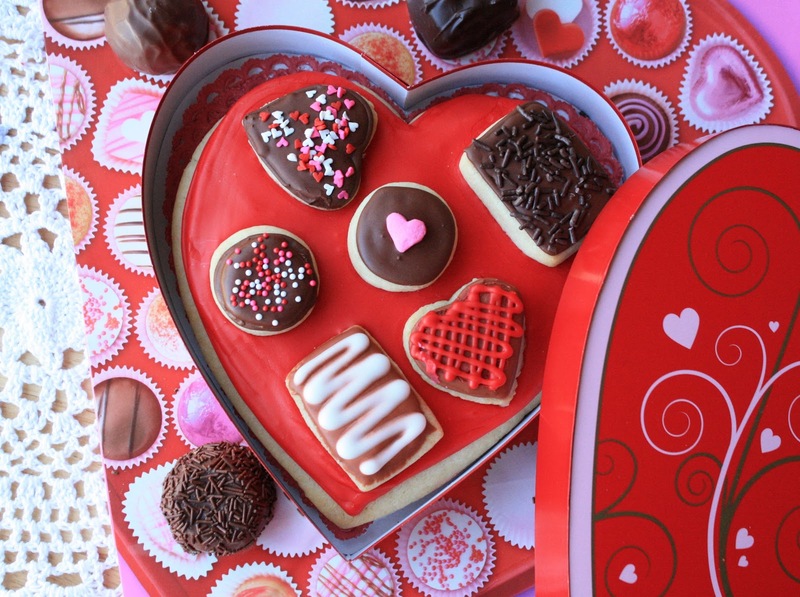 Have fun and share some LOVE with a box of chocolates~cookie style! I just saw this appear on Pinterest! I love, love, love it! Wish you were nearby, I would hop in the car and run over to see it in person and beg for a bite! This is over the top cute. I so want to try this! Oh I just love these! And can't wait to hear more about your tea party with the munchkins! Have a great weekend, Sue! Super super cute!!! Love the box too! Sue I love this!! Completely adorable! Hello Sue this is such a great treat and a such a sweet idea for gift :)love it. Hope to c u around! I will email you my address..... wish we lived near each other. I would send you savory foods and I can mooch off your beautiful sweet creations! Fabulous idea, Sue! Who wouldn't want to receive this special Valentine's Day box...I agree with Kay, wish we lived close! So cute Sue, I had to look twice to figure out that there was a big heaart cookie in the box. This is a wonderful idea. Those are the most adorable cookies ever, ever, ever!!!! That is the kind of "box of chocolates" that I'd love to be able to sink my teeth into. What a great idea. Glad you had a nice visit with some of your Munchkins and looking forward to hearing about that tea party! Love the look of these cookie chocolates. What a fun idea. These are so pretty! What a wonderful idea for Valentine's Day! This is about the cutest valentine cookie EVER Sue! Adorable! What an ingenious and creative idea! LOVE it! I'm glad you had fun with the munchkins in Texas too! Gorgeous! I love this idea. So creative and pretty too. This is so much fun, Sue!!! I love all the decorated cookies on top. Seriously, this is amazing!!! This is soo awesome! I wish I could get that for valentine's day! I love this idea, so cute! I can't wait to get into cookie decorating one of these days. Super dooper sweet - you always have the most fun ideas. Yum they would be good with chocolate cookie and chocolate royal icing - almost like the real thing but even prettier. I love this idea! This keeps running through my head 'Lifew is lahk a box of cookies made to look lahk a box of chocolates' ;) I would love this as a V-Day gift but I don't think my guy would be vable to pull it off lol On another note..next installment will be up tomorrow! Also hosting the next BBD challenge, but that will be in a separate post. This is so cute! Amazing! This is so darn clever and cute. What a great idea! so adorable!! I love it!! Your cookies are amazingly beautiful!!! This is so awesome! I love that huge cookie, that's just amazing to me, haha :) Great job, whoever gets one of these boxes is one lucky person! This is beautiful! All thoughts and efforts to assemble this box of chocolately cookies! I'm in love with this idea! Darling! I love that they're cookies! I found you through Tatertots and Jello. Thanks for sharing! I'd love it if you'd come by Themed Baker's Sunday and share your treat! This week's theme is Valentines Day. Sue, no membership at all, just join in by following the list on how to enter. I'm so glad you want to take part. You will most certainly bake one heck of an amazing bread with chocolate! The cookies are super cute. Great job!!! This looks lovely and fun! Adorable! You are so clever! I adore this idea!!! I'm pinning this right now :) Found you on At the Picket Fence! This is fabulous Sue! I have seen something similar but it was not a cookie. I love your cookie idea so adorable!! Happy Valentine's day. I'm loving this idea a box of cookies!!! I love these! What a cute idea!